As a farmer, that is about as agonizing to listen to as nails on a chalkboard. There are countless ways for us to lose yield every year, whether it’s frost, hail, excess moisture, insects, diseases, or countless other threats. Each one of those events is devastating in its own way; but at least you have some control over the living threats, like diseases and insects. The ones that fall from the sky are by far the worst. The last few years, as you will find on previous posts, have hit us hard with excess moisture and even some frost events. Cool and wet has been the name of the game. The advantage of that type of weather is that if you can avoid the extremes, you can grow some incredible crops. This year, weather has taken a 180 degree turn. Our crops are suffering under an oppressive, stifling summer sun, with daytime temperatures easily reaching over 30 degrees day after day. Rainfall has been limited, to say the least. This year, we are facing an event we haven’t seen in many, many years; a drought. My father started farming back in the late 70’s, a time not unlike this one. Farms were doing very well, with fantastic grain prices for quite a few years previous. Land prices were skyrocketing, and much of the Prairies had grown at least a few good crops to cash in on the good times. Then came the 80’s. The 1980’s was one of the driest decades ever recorded in Western Canada, perhaps even worse than the infamous Dirty 30’s. Of all those years of dry weather, 1988 is the one that stands out as the worst. Dad talks about that year a lot. Crops barely even germinated, and most died soon after emergence. Weeks of extreme heat and wind sucked the life out of the entire crop. Keeping enough feed around for the cattle was terribly difficult, and water had to be pumped and hauled from just about every slough they could find. While this year is not at all on that level for our area, for some areas west of here those comparisons are starting to be made. That is a disturbing thing to hear. Serious feed shortages are going to arise, and there are some truly sick looking crops out there that are past the point of no return. Ironically, despite all my frustrations about the past couple of years, it is because of all that excess moisture last year and the years before that we have the crop that we do. Despite only receiving three inches, or 75 millimeters, of rain since the beginning of the crop year, we have a crop stand we haven’t had in many, many years. Everything was pointing to an above average crop… but we haven’t had a significant rain now for nearly three weeks. Our subsoil moisture is slowly running out, and as temperatures climb into the low 30’s, our crops are beginning to feel the pinch. 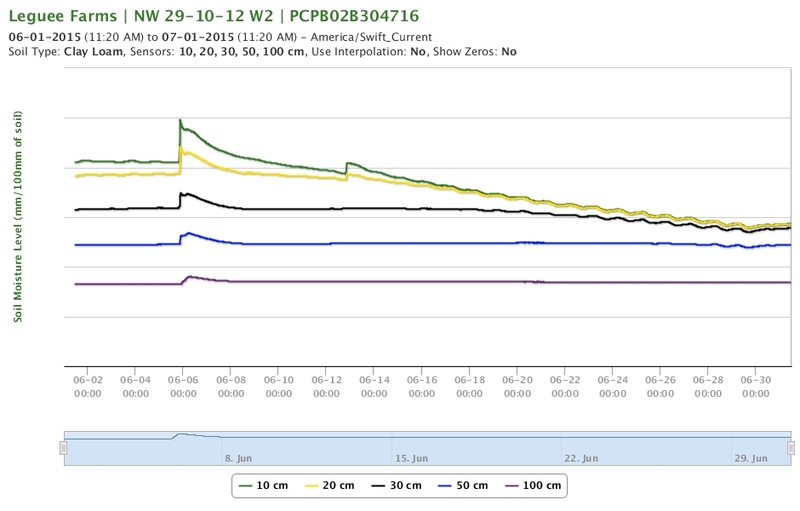 Any day above 25 degrees starts removing yield potential from wheat and canola, and as the days turn into weeks, that potential will really start to collapse. Picture yourself as a wheat plant standing out in the middle of a field. As the sun’s heat bears down on you, what can you do to keep cool? You can’t walk over to a tree to find shade. You can’t jump in a pool of water to cool off. All you can do is stand there and drink as much water as you can to stay hydrated and cool. So, naturally, you drink a lot of water. Right now, with the heat these crops are experiencing, they are using 10 mm of water per day. Even with the substantial soil reserves we have, heat like that will burn it up very quickly. This is data from our John Deere Field Connect Weather Station. You can see each of the different soil depths, and the water level in each down to one meter. It is fascinating to watch throughout the season – but you can see a marked reduction in soil moisture that is simply not being replenished. The situation in our area, despite the recent heat wave, is still pretty good. We have an excellent stand of deeply rooted crops that are adapting to drier, hotter weather. 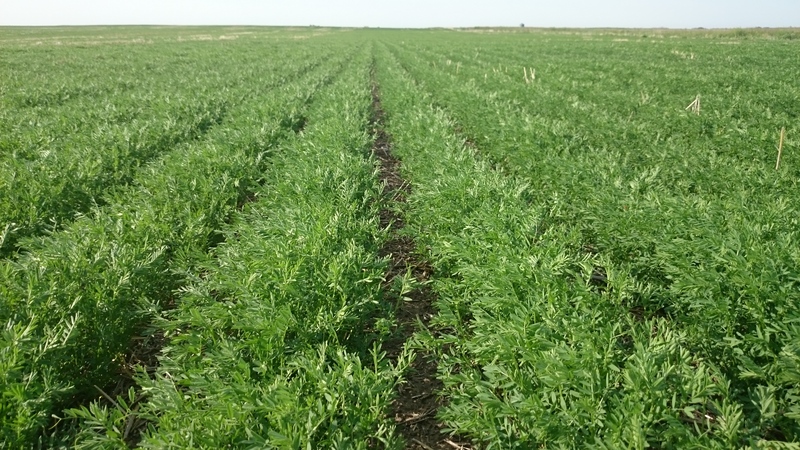 We also tried more drier-season crops this year, due to the forecast for a summer like we’re currently seeing, such as lentils, peas and winter wheat. I really need to point out that we have been very fortunate so far this year. But that won’t last forever. We need a rain, and we need it soon. While some thunderstorms have popped up here and there and provided relief to a couple of fields, it has been far from good enough. And, the danger of these summer storms is that they rarely only bring rain. 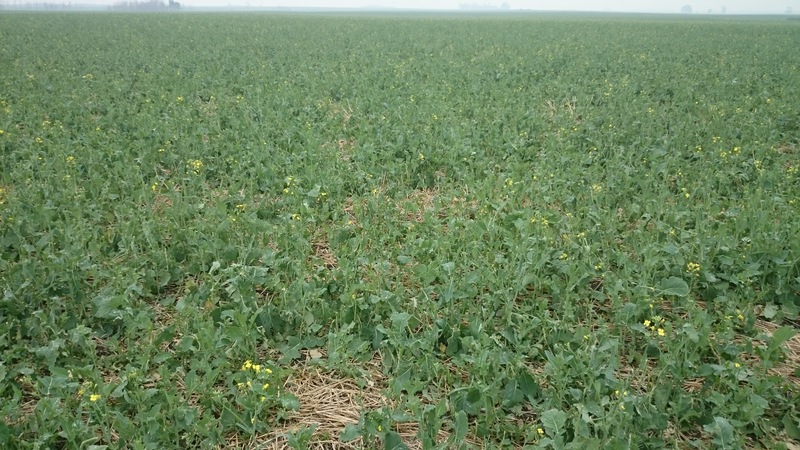 We had substantial damage to a canola field last week from a hail storm. With the right weather, it can probably recover fairly well, but the next couple of weeks will be critical for it. Don’t get me wrong; I love going to the lake, and it is nice to have some hot weather to go along with it. But day after day of 30+ degree temperatures are critically damaging to crops. Not to mention that trying to work outside in weather like that is anything but enjoyable. For a long time, my parents farmed in some pretty dry weather. It has only been the past 7 years that we have wished against rain. Maybe this is just a return to normal. One thing there is little doubt about though is this: if this heat continues, and rain fails to materialize, a large part of the Canadian Prairies will be in rough shape. There are few threats farmers fear more than drought, and for the first time in 13 years, that may just be what we’re in.